When you’re at the pet store looking for new toys for your pup, there are always rope toys on display. They seem to be essential to any dog’s toy box. Some have knots, some have handles, and some even have balls or bones attached to them. And like many toys, rope toys can give your four-legged friend some great benefits. 1. Playing tug-of-war with a rope toy can strengthen the bond between you and your dog. 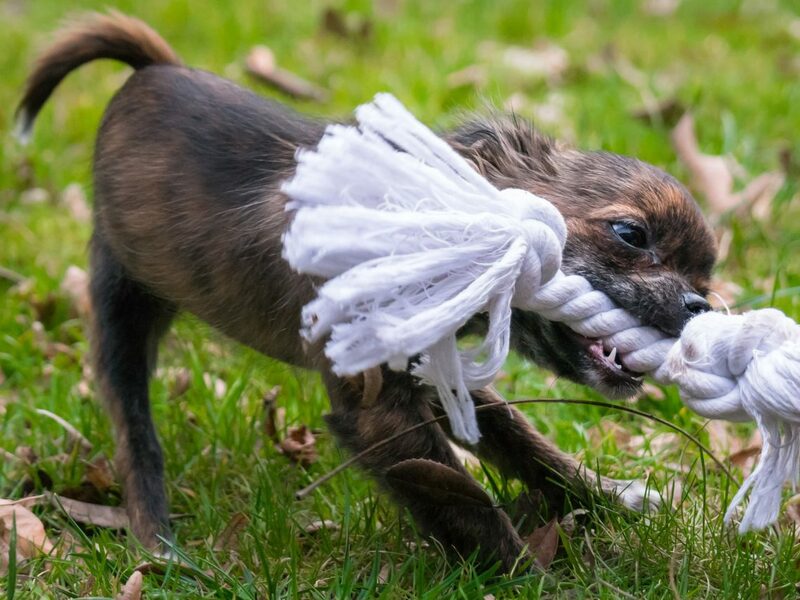 Occasionally letting your pup win a game of tug-of-war can help boost his confidence, especially in dogs or puppies who are more shy or reserved. Just remember to not overdo it—if your dog constantly wins, he may start to over-assert you. Work with a certified trainer who can help you teach your dog how to play tug appropriately. 2. Rope and tug toys can help redirect nipping or biting behavior. Some dogs and puppies simply get nippy when they want to bite something. These ropes can provide them with a biting and chewing outlet. 3. Lots of people use rope toys as a reward. Dogs love these toys, especially when their owners are playing with them. You can use rope toys as positive reinforcement when you’re training with your furry companion. 4. Great for your dog’s teeth! Periodontal disease is the most common dental condition in dogs. It’s extremely important to focus on you pup’s dental health. When your dog chews on a rope, it helps clean his teeth by removing plaque. 5. Speaking of teeth, here’s a tip! If you soak a rope toy in water, it absorbs the liquid so you can freeze it. When your puppy gnaws on the rope, it’ll soothe his tender gums and potentially prevent him from chewing other things you don’t want him chewing on. 6. Rope toys are easy to carry—for you and your dog! They’re portable for you. And they’re fun for your dog to carry, especially if he’s a retrieving breed that likes to hold things in his mouth. Buy an appropriately-sized rope toy for your dog. If the toy is too small for your dog, you dog may be at risk of choking. Consider the material. If your dog is an aggressive chewer, you’ll want a sturdy material. Dogs who gnaw and chew intensely can shred and ingest small rope fibers, which can cause digestive problems. Some ropes are made of the same materials as common household items like shoes, clothing, or furniture. Be careful when selecting the material so you don’t encourage your dog to transfer his chewing to non-toys. And lastly, after you surprise your pup with a new toy, be sure to supervise him. Don’t leave your dog unattended. You could have issues with broken or ripped pieces of the rope toy. 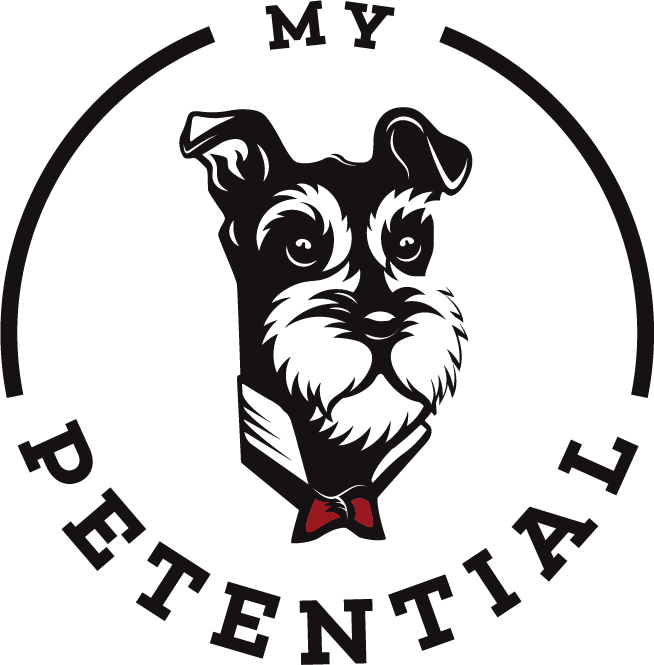 Now go out and have some fun picking out a new toy for your four-legged friend! 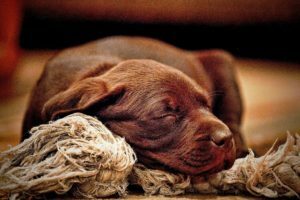 Very informative article about the benefits from rope toys. You are talking about toys for pups but can I also buy these rope toys for a 2 year old dog? Or are they specifically for pups? My dog is obsessed with my slippers. I’s really difficult to maintain them out of his reach. If I can get a replacement that would be awesome. Thanks for sharing your knowledge. Aww I love the photos! Great article — I agree with all of your points! As a dog owner, this is valuable information. Thanks! Great post, I been meaning to get more toys for my dogs lately, never knew a rope could be such a good toy with many benefits, thanks for sharing. Great informative article. I have a cockapoo and she is around 2 and half years old and guess what, her favorite game is tug of war! She is the exact opposite of shy and always puts in a great fight. It’s so fun and I love getting new rope toys! My little Yorkie just loves playing tug of war with his ropes!! Funny thing is that he likes to go for bigger ropes (my friend has a larger rope for her larger dog and he just goes bananas for it) but he is just obsessed with playing in general. You have the cutest images on this website! Omg first off the name of your site is just wonderful! I love it, so clever. Secondly, it is so great how you approached this topic and its great to know all of these benefits for our canine friends. What do you find is a dog’s most treasured toy above all else? Is there one that seems to win out over the rest? What about you? What is your favorite dog toy?